I went on another tour with the Czech travel agency arsviva at the beginning of May in 2014, this time concentrating on Romanesque and Gothic architecture in south Bohemia. 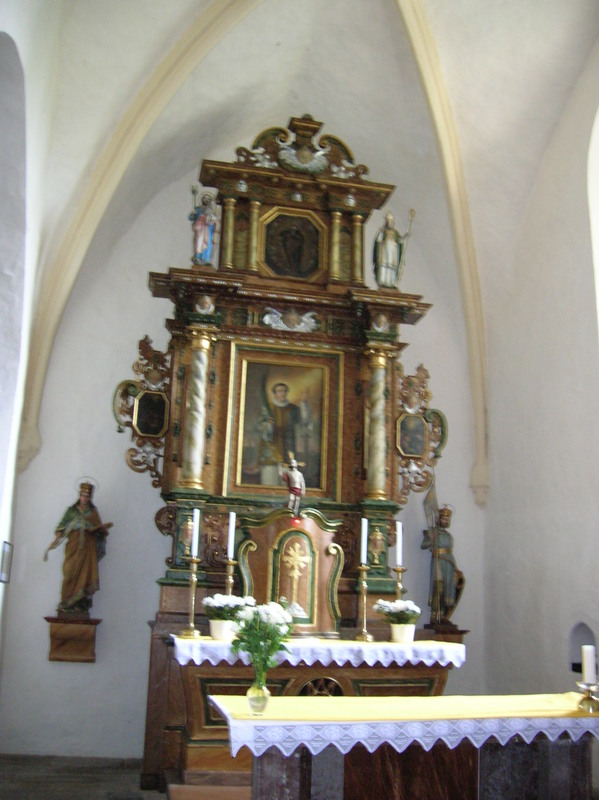 We would explore many churches in villages, and I would finally see more than the bus station in Písek. After so many years in the country, I had seen all the most popular sights. I yearned always to always something new, something that would give me a new perspective on life and art, and I thought that traveling to Romanesque and Gothic churches in villages and visiting Gothic castles would be just the way to do that. First we stopped in the village of Mirotice, which happens to have two main squares. Most villages have only one. The bus stopped across from the new town hall, which was only about 50 years old. We walked to St. Giles’ Church, Romanesque in style. There are not many churches in south Bohemia with Romanesque features. It hailed from the middle of the 12th century. I admired the lattice Romanesque window on the tower. The church had an intriguing past. 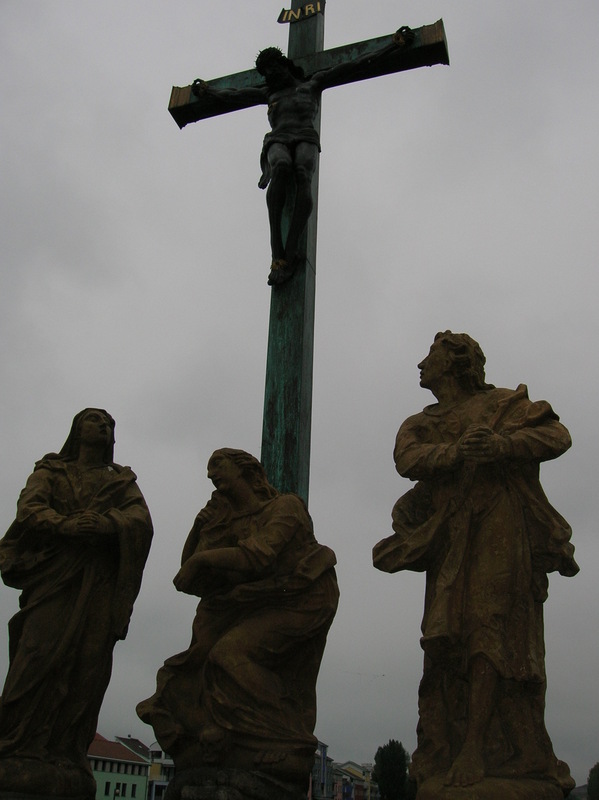 In 1497 the worshippers had been of the Utraquist faith, who had been Hussites asserting that both the bread and wine should be given to worshippers during the Eucharist, but from 1664 to 1694 Catholics had prayed there. I recalled that the Utraquist branch of Hussites had triumphed over the radical Hussites during the 15th century Hussite wars. Unfortunately, it was not possible to go inside (we would visit the interiors of most of the churches on our itinerary, though, thanks to our guide), but a Baroque makeover occurred in 1694. PseudoRomanesque reconstruction followed, from 1870 to 1872. I loved seeing elements of Romanesque and Gothic architecture. It amazed me how Romanesque and Gothic elements could survive so many centuries, through all the trials and tribulations of Czech history. 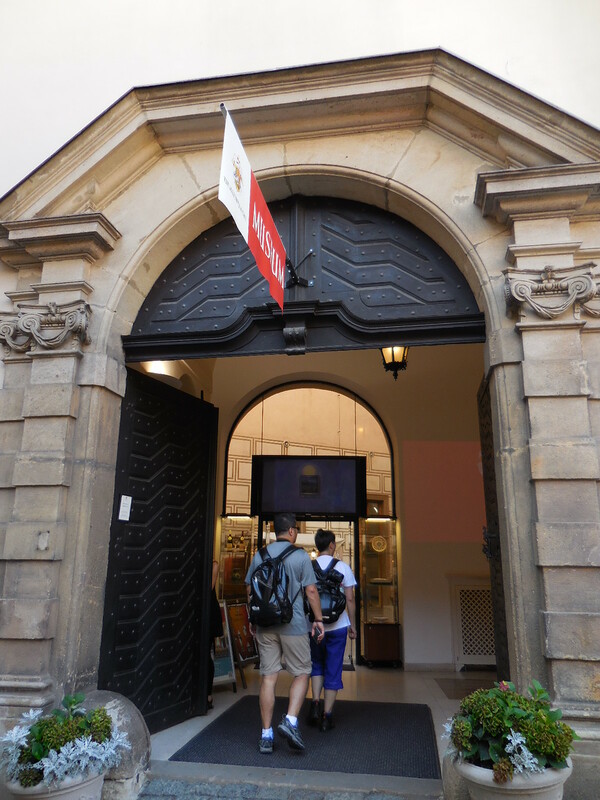 Then we meandered along some narrow cobblestone streets to a museum on the site of the former building where artist Mikuláš Aleš had been born. Aleš had made a name for himself as one of the top 19th century Czech painters and illustrators, among other accomplishments. It fascinated me that in such a small village there could be any intriguing sights, let alone two. I felt as if the village was revealing its secrets to me. The next church we visited was dramatically perched on a hill by itself rather than in the midst of a village. 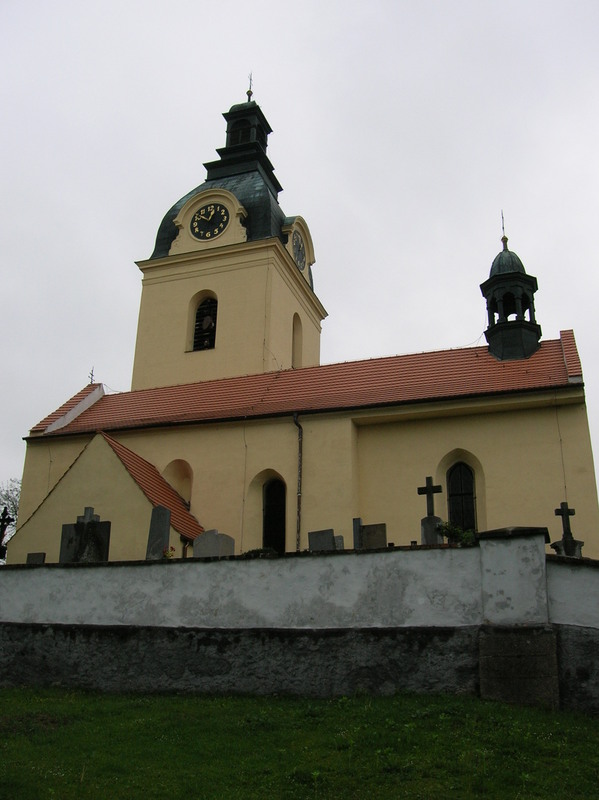 The Church of Saint James the Greater in Čížová boasted a ground plan with early Gothic masonry and Late Gothic supporting pillars. It had never had a tower, which was an oddity. 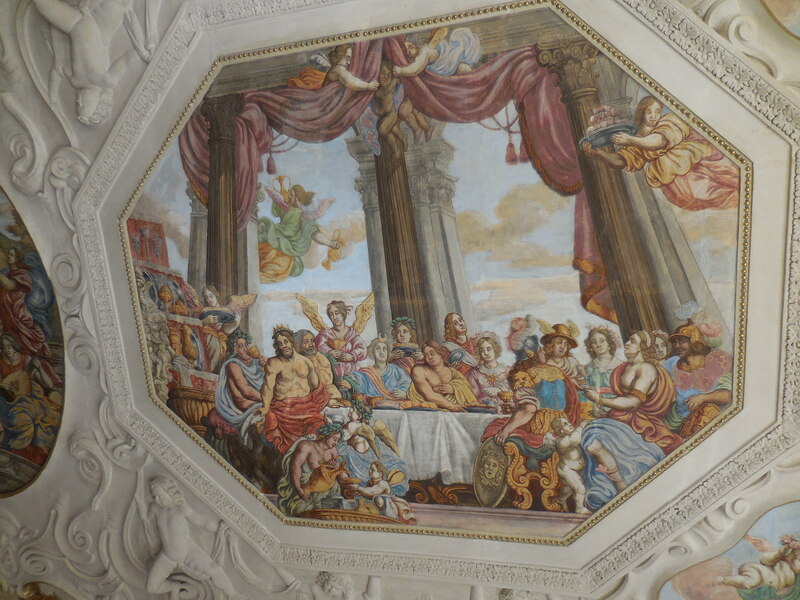 Baroque decoration greeted visitors inside, but we did not have the chance to see this interior. The churches we were visiting were not open for the general public. It was difficult to obtain official permission, so that someone would open them for us. Just seeing the exterior was breathtaking enough. And later we would see many interiors. There is another intriguing feature of the church as well. 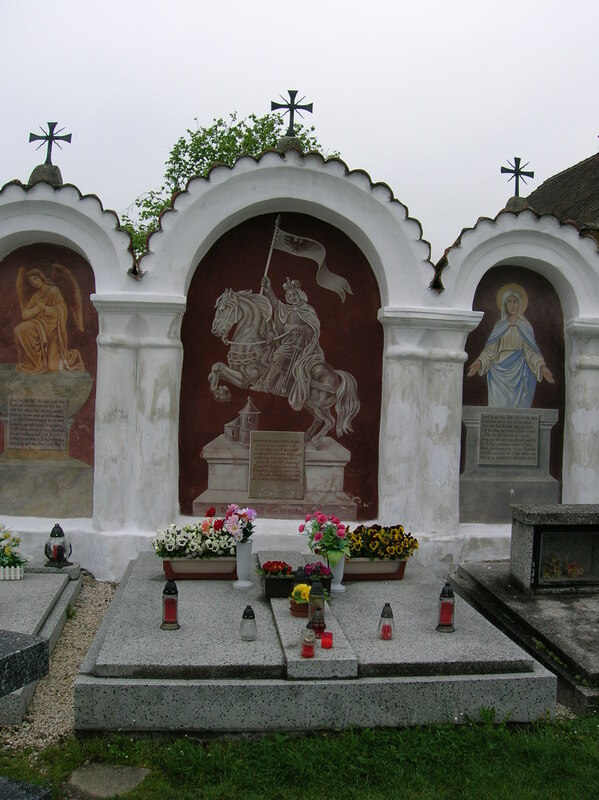 The tombstones of Knight Ludvík Lorecký and his two sons, who were murdered by serfs in 1571, are in the church. 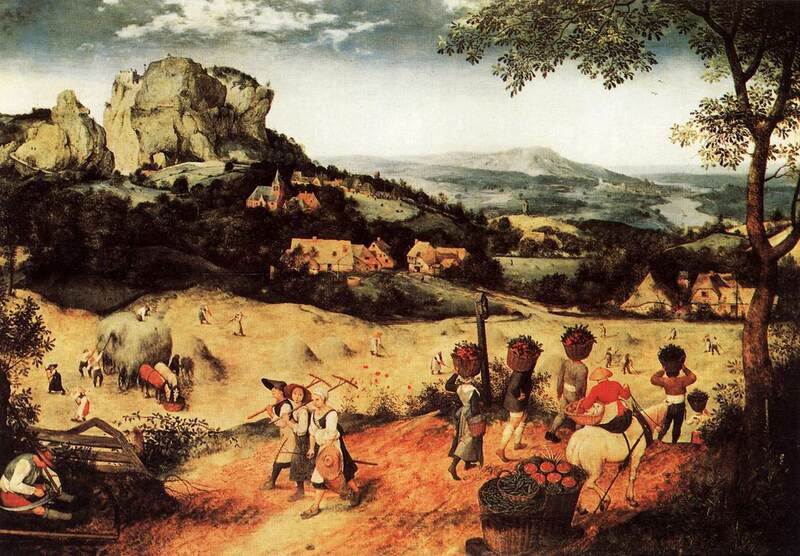 I wondered if the serfs had revolted because they were hungry or overworked. I wondered who the knight and his sons were. Did they hail from this village or did they just happen to die here? How did Lorecký become a knight? Were his two sons knights, too? How old were they when they died? I fascinated me how so many questions could arise from a church in such a small town. 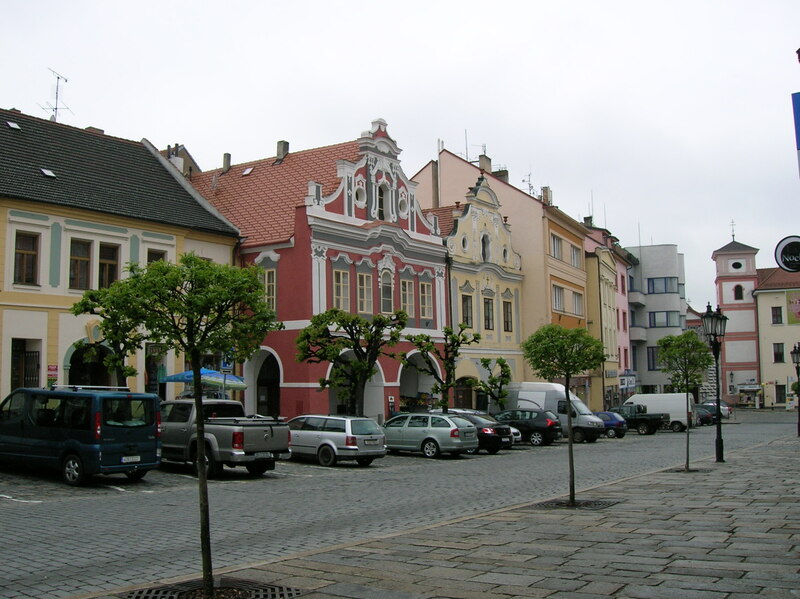 I was very excited about the next stop, the town of Písek, where I had only been at the bus station. For many years I had wanted to explore Písek, but I just never had the time or had never made the time. Actually, I had been under the impression that there was not much to see except for the Stone Bridge that was the oldest bridge in the country, even older than the Charles Bridge in Prague. In Central Europe only Regensburg’s bridge was older. I fondly recalled my several days discovering stunning medieval architecture and visiting a lavish palace in Regensburg not that long ago. Písek’s history may go back to the 12th century. 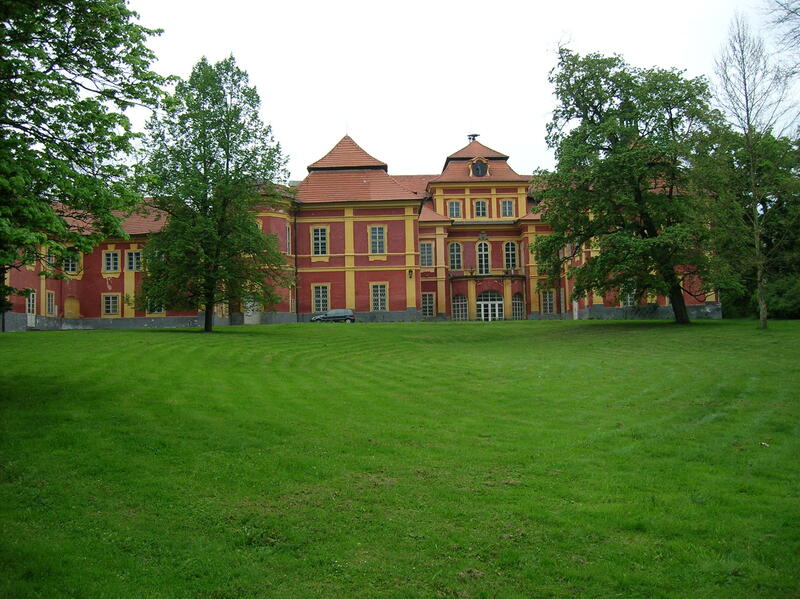 There was a castle in Písek, built by Czech King Wenceslas (Václav) I, before the middle of the 13th century. 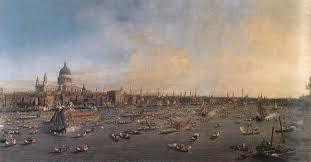 The town was first mentioned in writing during 1243. 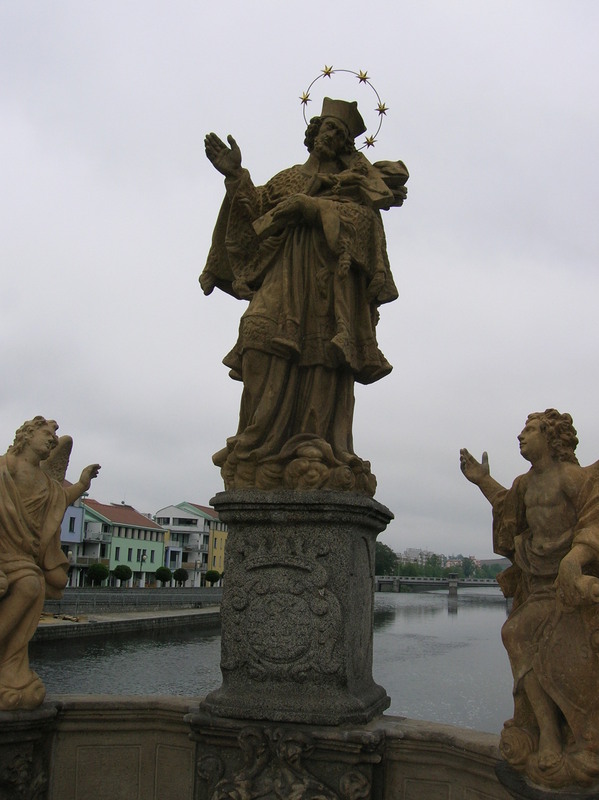 During the Middle Ages, in the 14th century, Písek prospered because gold was found there. Wenceslas’ son Přemysl Otakar II continued to expand the town during the 13th century, and Písek also played a significant role in the Czech lands under Charles IV’s rule during the 14th century. Czech kings often stayed in Písek. In the 15th century, during the Hussite wars which were fought between various branches of Hussites, with monarchs helping out the moderate Hussites, Písek was controlled by the Hussites, followers of Bohemian priest and reformer Jan Hus who were battling against the moderate Hussites and other world powers, until 1452. The town flourished during the 16th century, becoming very wealthy. 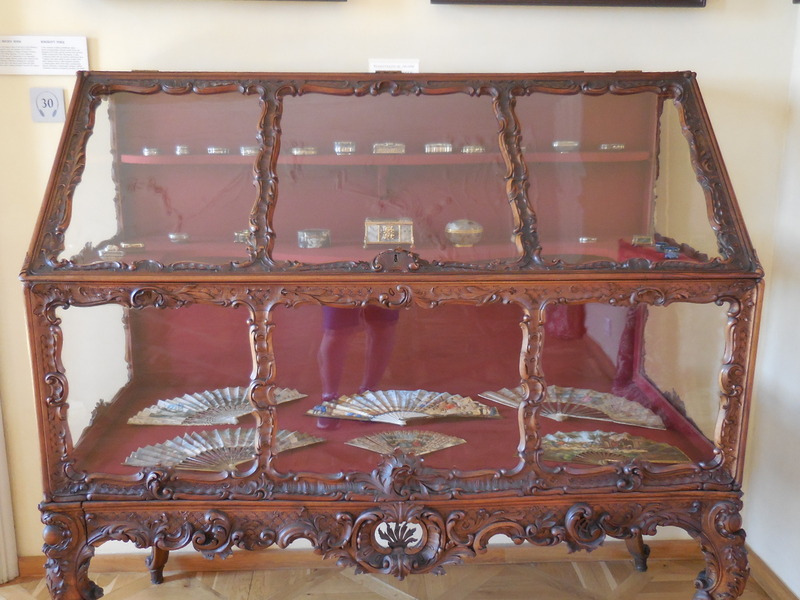 The 18th century brought the plague while during the 19th century there were more positive developments, namely the National Revival, a cultural movement promoting the Czech language, Czech culture and Czech nationalism. 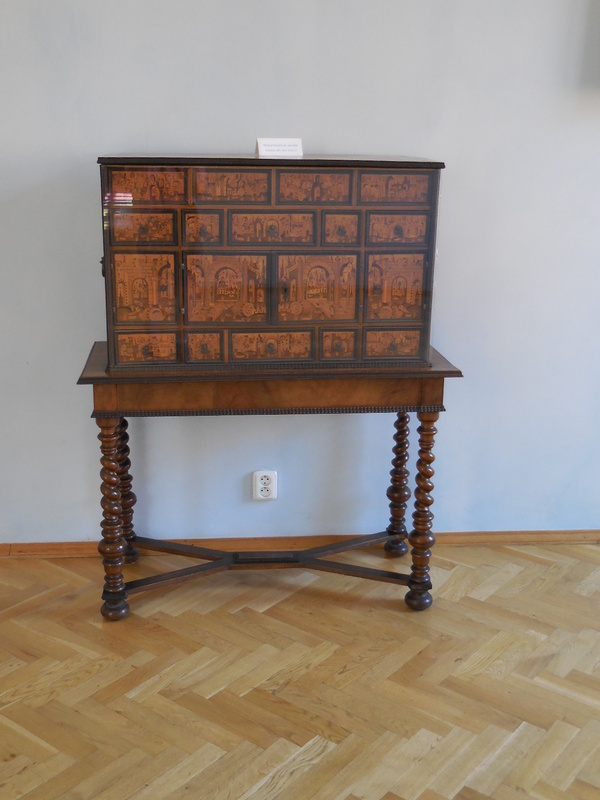 More Czech cultural groups and Czech schools were built during that golden age. Písek focused on industrialization during the second half of the 19th century and even holds the honor of being the first Czech town with permanently installed electric public lighting. While Písek experienced rosy days during the democratic First Republic, the tragic era of Nazi rule followed. On May 6, 1945, the US army liberated Písek. Under Communism factories dotted the town. 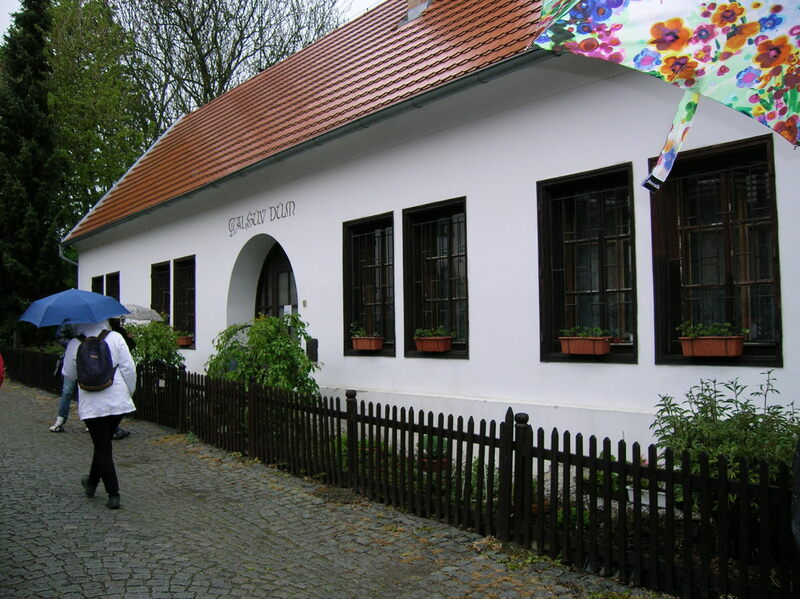 Písek was badly damaged during the 2002 floods that ravaged the country. First, we visited the deanery’s Church of the Birth of the Virgin Mary, which hails from the second half of the 13th century and was constructed as a pseudobasilicia with three naves and a five-sided presbytery. Its tower reaches 72 meters. Inside there was an astounding 18th century Baroque chapel dedicated to John of Nepomuk, a Bohemian saint who drowned in the Vltava River, murdered on the order of King Wenceslas in 1393. Above the altar in this chapel I saw vedutas of the town. 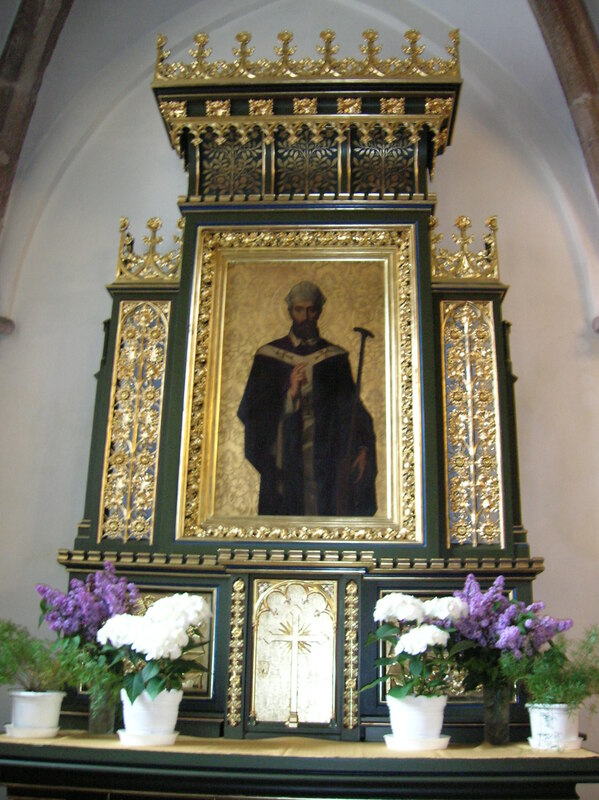 The main altar of the church was Neo-Gothic, from the 19th century. 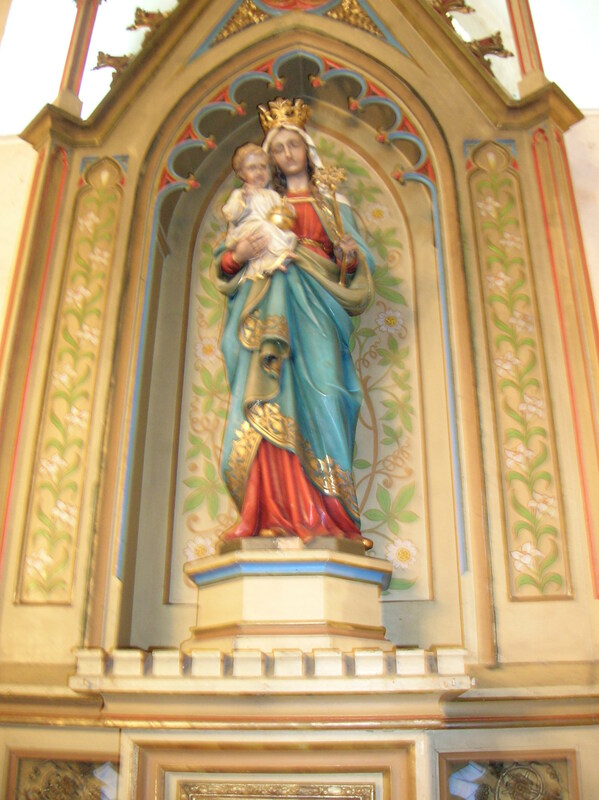 A copy of the statue referred to as the Písek Madonna was located on a side altar. The original, dating back to the 15th century, was stolen in 1975. 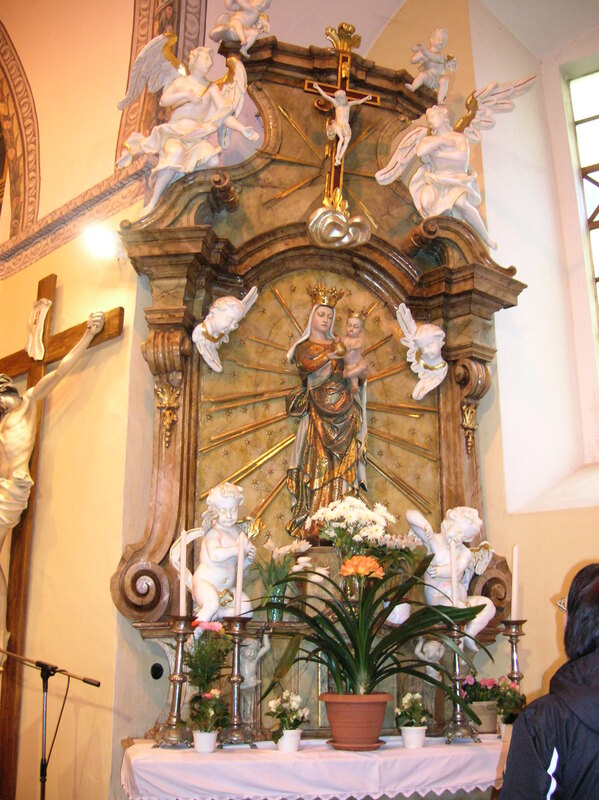 The pulpit hailed from 1887, and its six-sided cover featured sculptures of five angels. I noticed that one was holding a harp and another was playing the flute. The organ loft went all the way back to the beginning of the 16th century, while the organ was much younger, dating from the early 20th century. 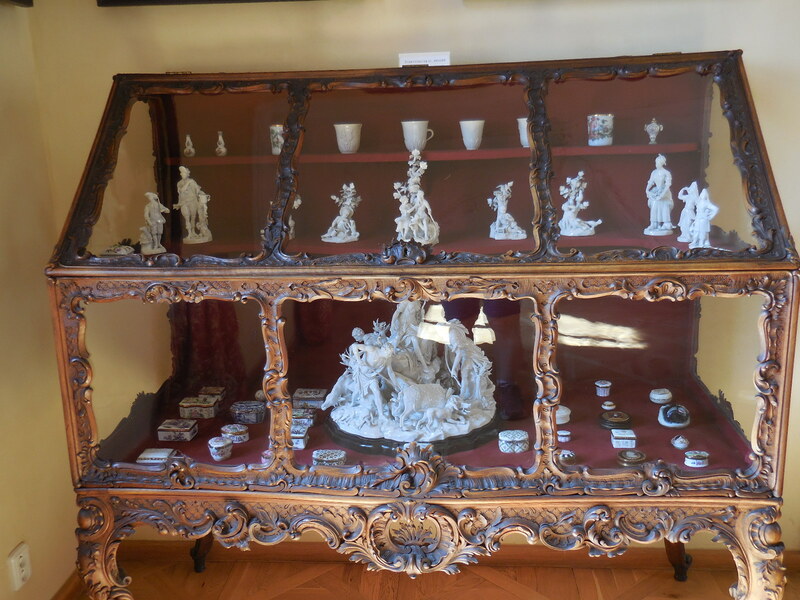 I also admired the richly carved 17th century Baroque candelabras. The pewter baptismal font was in Renaissance style, from 1587. 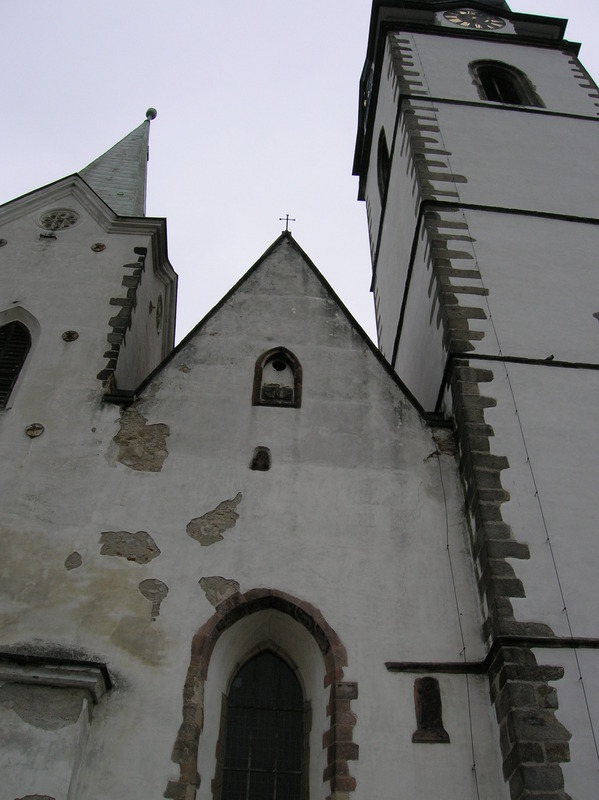 There were many Gothic characteristics of the church as well. It boasted sturdy, early Gothic ribs and portals. The presbytery, the northern tower and the three naves hailed from the second part of the 13th century, and the sacristy dated from around 1300 while the southern tower could be traced back to 1489. One of the windows was forged in the 13th century. 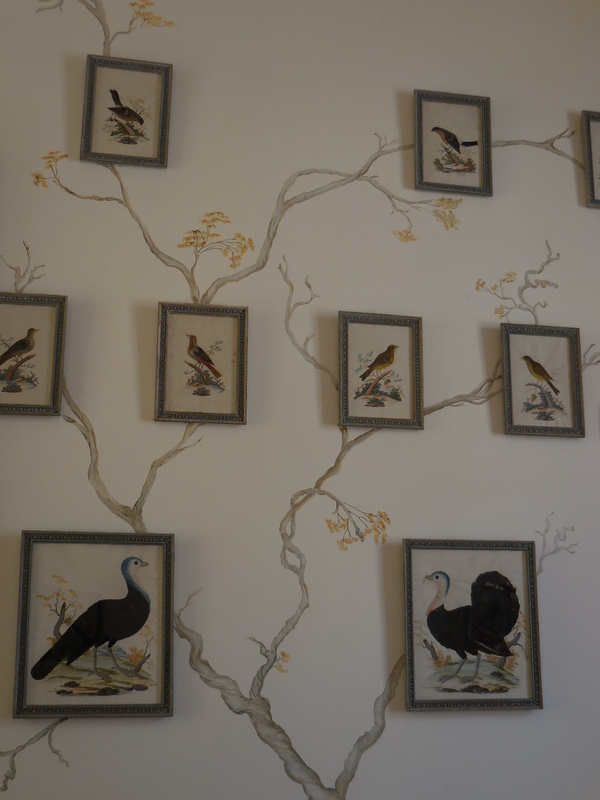 The Gothic wall paintings were spectacular. I could hardly believe that they dated from around 1270. I peered closely at the 13th century rendition of a suffering Christ with figures of angels carrying a cross, nails, scourge and a crown of thorns. The triumphal arch was painted during the first part of the 14th century. Some participants followed the guide to the castle, but I joined a group of women to get a bite to eat. We found a basement pub with cozy wood paneling. After lunch we walked through the town for a short while. I noticed a small Renaissance church with amazing sgraffito on one of the three main squares. 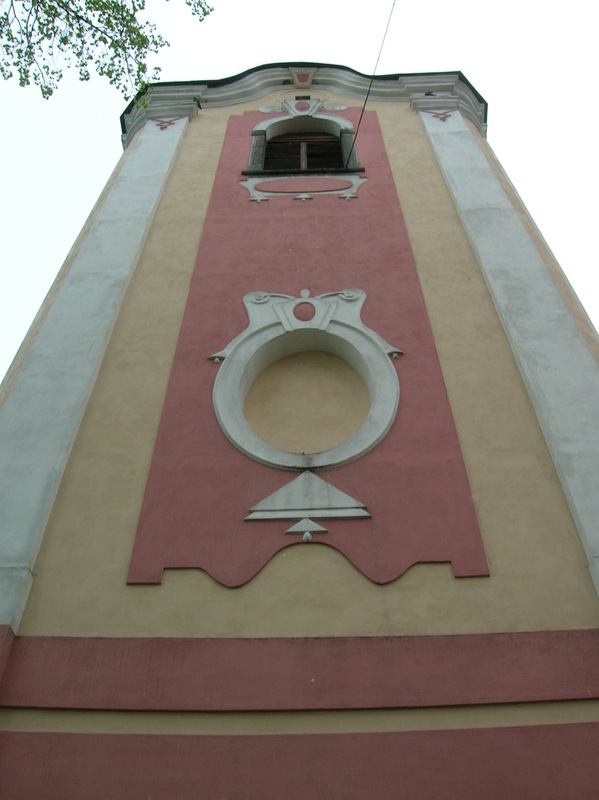 It was called The Church of the Elevation of the Holy Cross and had a very short tower. The church was all that was left of a monastery founded at the same time as the town itself. 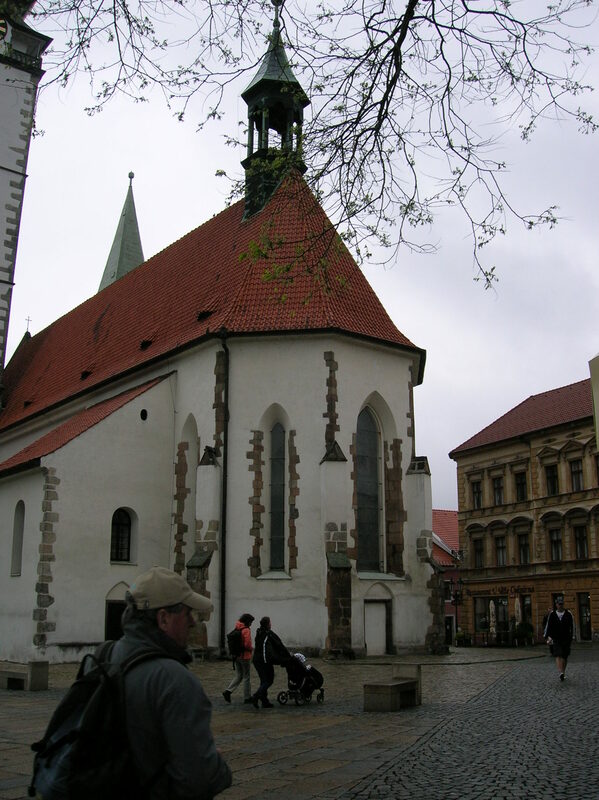 It had been destroyed in 1419 during the Hussite wars, when Písek was full of Hussite supporters. Unfortunately, it was not possible to walk through the church; we had to look through a grille. Still, the interior was more than impressive. 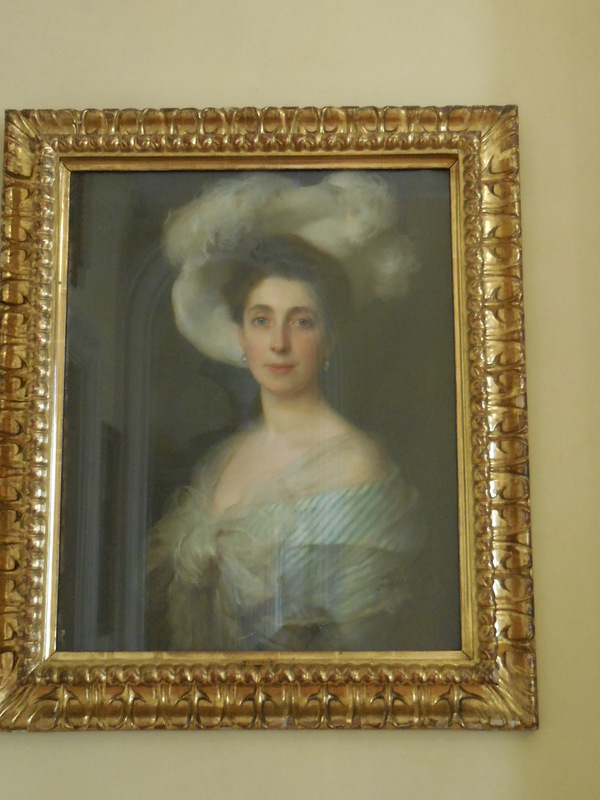 We had time to walk through the exhibition about the Písek countryside during the 19th century and then went downstairs to the space with the larger-than-life portraits of Czech rulers. Oddly enough, the painter had depicted all the Czech leaders with the same serious expression, nose and chin. The original sculptural groupings from the Stone Bridge were kept here as well. I had trouble taking my eyes off them. They were astounding. Then we left the museum and crossed the Stone Bridge over the Otava River. The oldest bridge in the country was like a miniature Charles Bridge with evocative statuary. The town cemetery had been founded in 1549, and the deceased were buried there until 1950. It was changed into a park during 1975. The Holy Trinity Church, mostly used for concerts, had a very different sort of interior than the others we had visited. 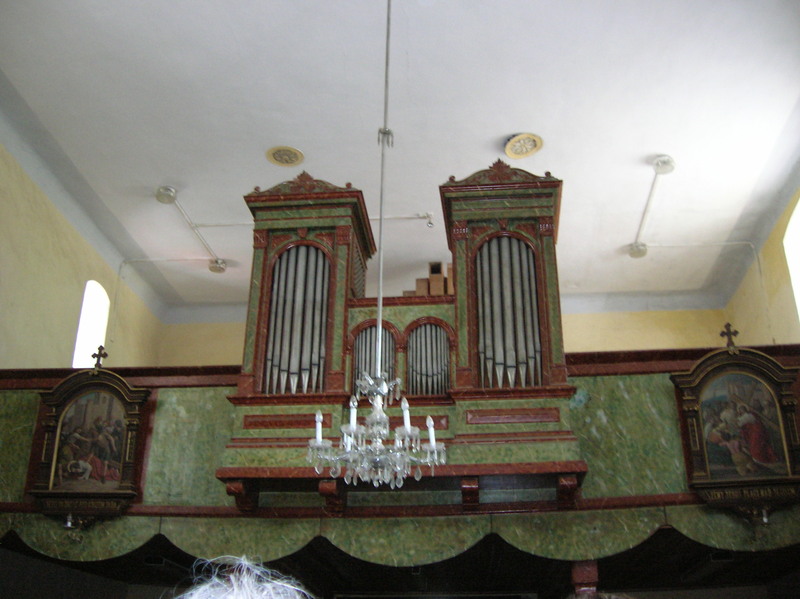 It was decorated with brightly colored, abstract wall hangings and a new organ, donated by the 20th century world traveler and author, Jiří Hanzelka, who was best known for his travels to Africa and South America. 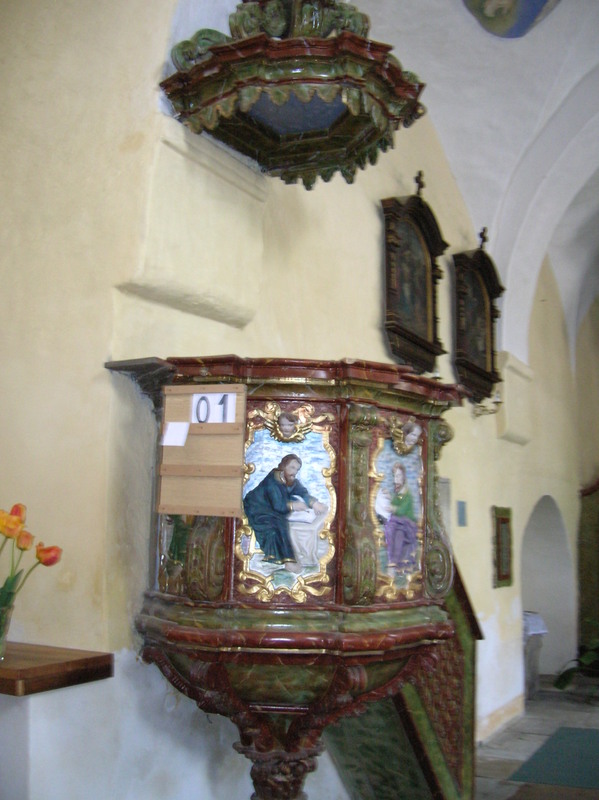 There was also a remarkable pulpit with intarsia. The holy place had become a concert and exhibition hall during the 1980s as the Communists had stripped it of its Renaissance identity, destroying the main altar and other furnishings, including the Renaissance organ loft. This destruction was just one example of the Communists’ lack of respect for religion and art. I am so glad I had not had to live through totalitarianism. 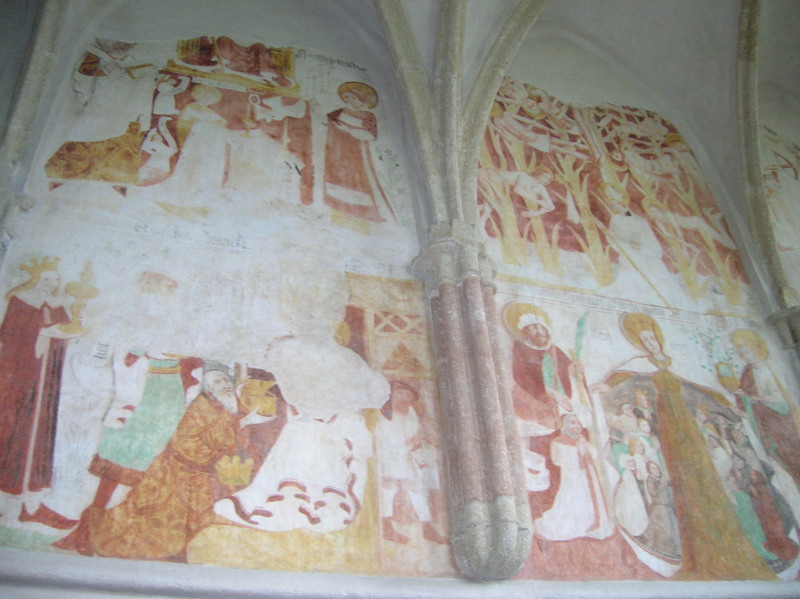 Later, thankfully, the church’s Renaissance wall paintings had been restored. In the bell tower we saw tombstones from the 1300s. 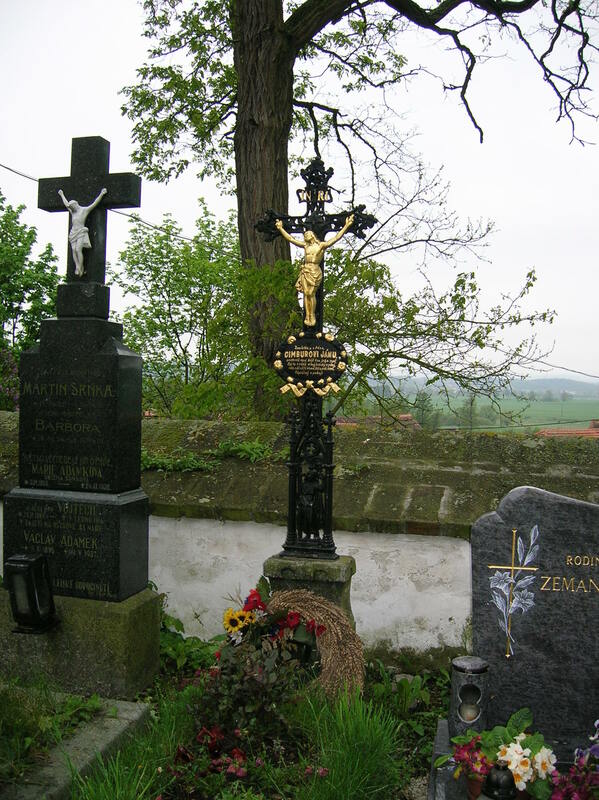 Renowned Czech historian August Sedláček was buried in this cemetery, too. He compiled the 15-volume work Castles, Chateaus and Fortresses in the Czech lands, which was published at the end of the 19th century and the beginning of the 20th century. The next stop was Putim, probably most famous for being mentioned in Jaroslav Hašek’s mammoth, early 20th century, anti-militaristic novel, The Good Soldier Švejk, featuring soldier Josef Švejk, who exhibits passive resistance and may or may not be an idiot. Scenes from the 1957 film based on Hašek’s satirical masterpiece set during World War I in the Austro-Hungarian Empire had been shot in this town that was founded in 1205. But that was not Putim’s only claim to fame. 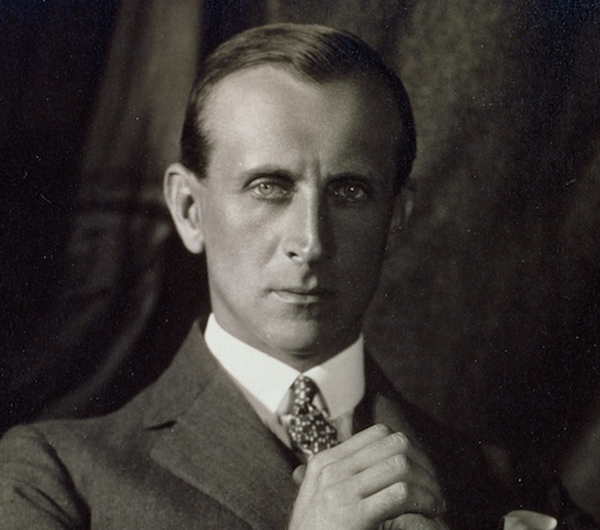 The 1908 film Jan Cimbura was based on the life of a Putim farmer by the same name. I saw his modest but impressive grave from 1898. The movie, adapted from a novel by Catholic priest Jindřich Šimon Baar, takes place from 1848 to 1898, examining 50 years of the life of a good Christian and farmer in south Bohemia. In St. Lawrence’s Church I admired a Gothic window, wooden Gothic vaulting, Gothic masonry and a 13th century portal. The furnishings were much younger, though. 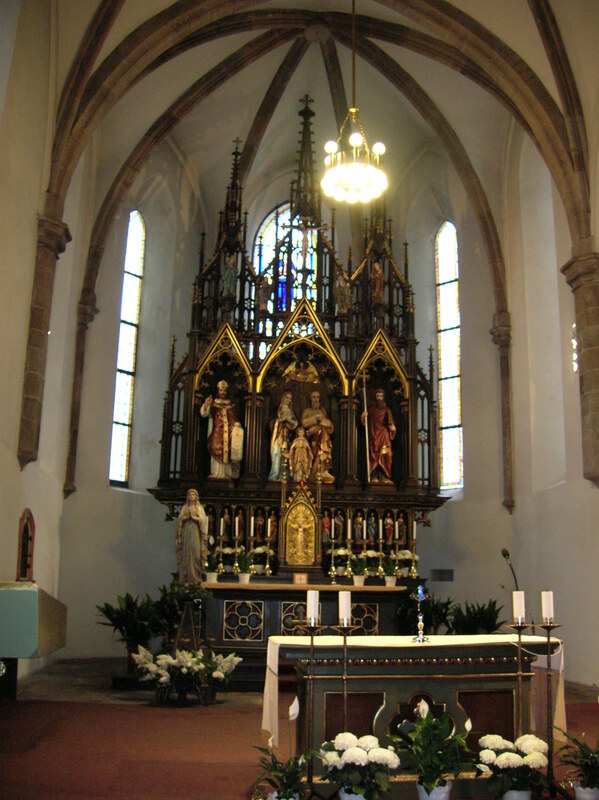 The main altar was probably created around 1650, and the other parts of the interior most likely were made around 1700. The impressive tombstones inside the church dated from approximately 1600. One of the bells, called St. Andrew, was original and hailed from 1553. This church had a characteristic that I had never seen anywhere else. 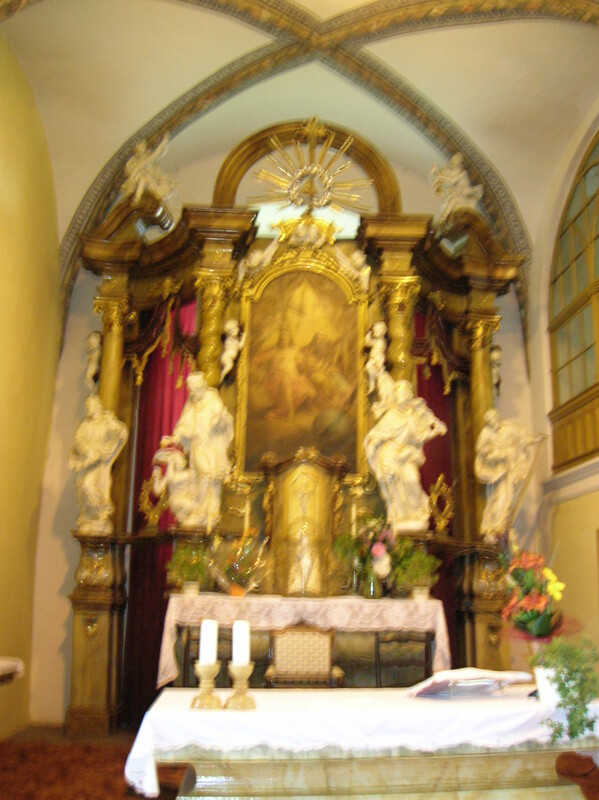 It had two main altars with different seating arrangements for each altar. It fascinated me how it appeared to be two churches built into one. I read that one part of the church had been for Catholics while the other part had been designed for Utraquists, It certainly had an intriguing ground plan. St. Giles’ Church in Heřmaň also boasted Early Gothic construction. The western tower dated back to the beginning of the Middle Ages. While the village was first mentioned in writing during 1227, the church was founded in 1254 as it was originally late Romanesque. The furnishings were much younger, though. 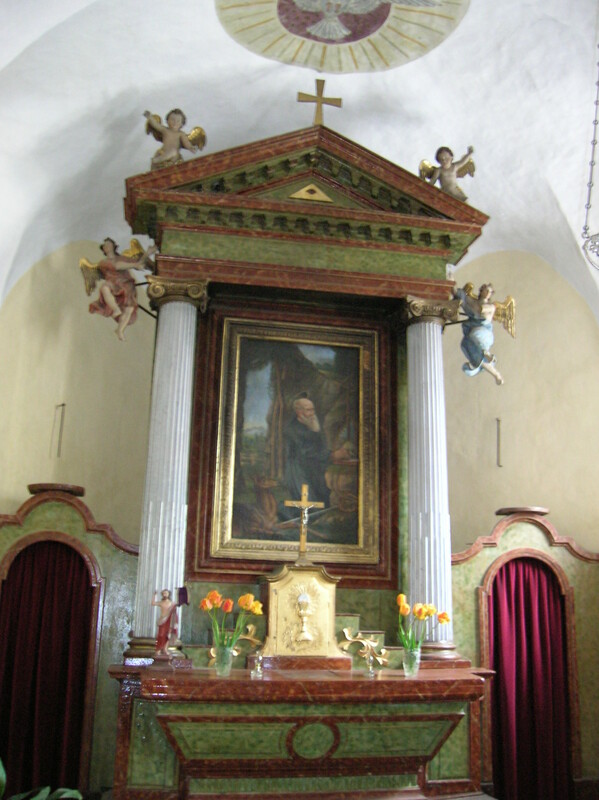 The interior was Baroque from 1720 to 1721. Two elegant white columns framed the painting at the main altar, Classicist in style, dating from the 1800s. Then our itinerary took us to the Church of Saint Havel in Myšenec, which also had experienced a Romanesque birth. On what is now the sacristy was originally a Romanesque church with apse from the 11th century. There was a Gothic window, too. 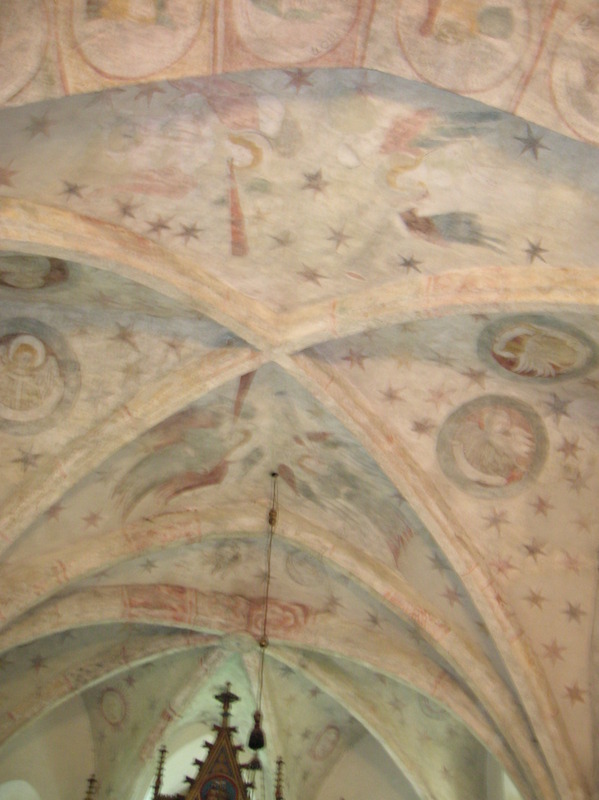 What impressed me most were the Gothic frescoes on the walls and the vaulting of the sacristy. They dated from 1340 to 1350. In the presbytery Hell was pictured with a burning tower and the devil, and Heaven made an appearance, too. 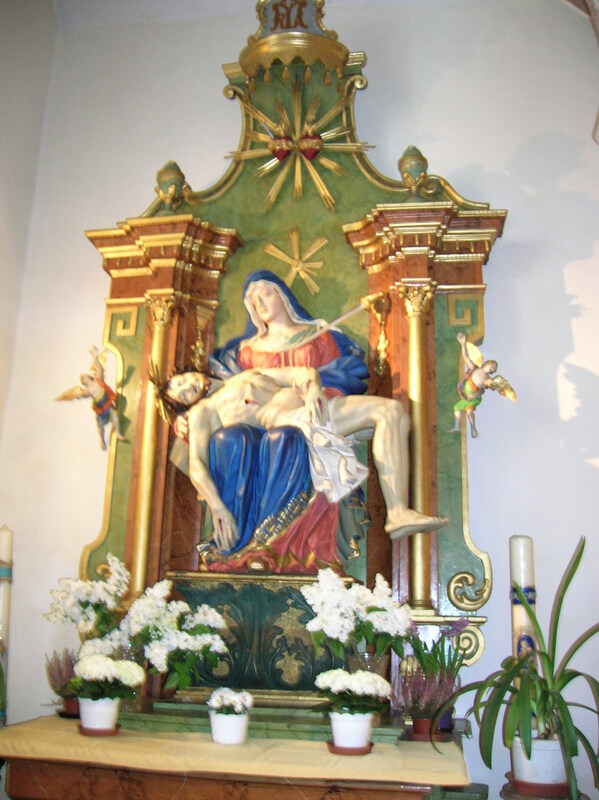 On the north side the life of Saint Catherine was depicted. 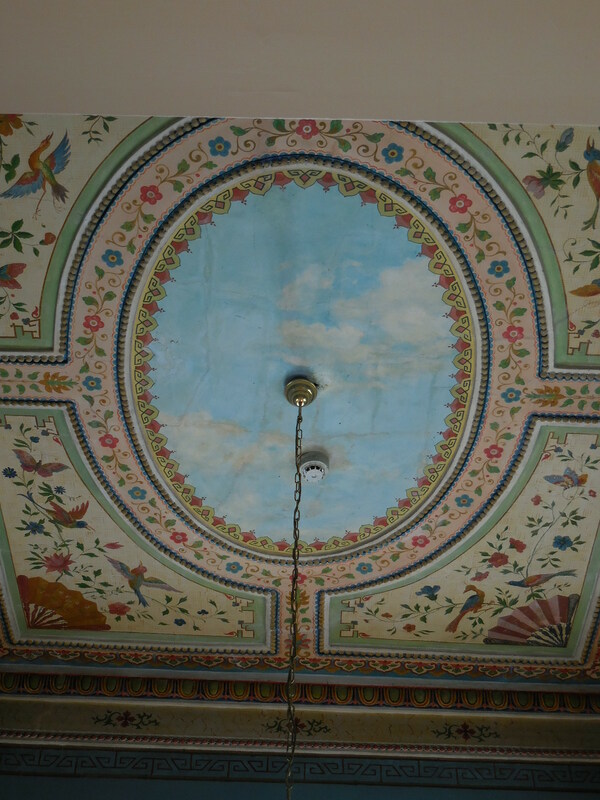 I loved the stars and angels on the ceiling. 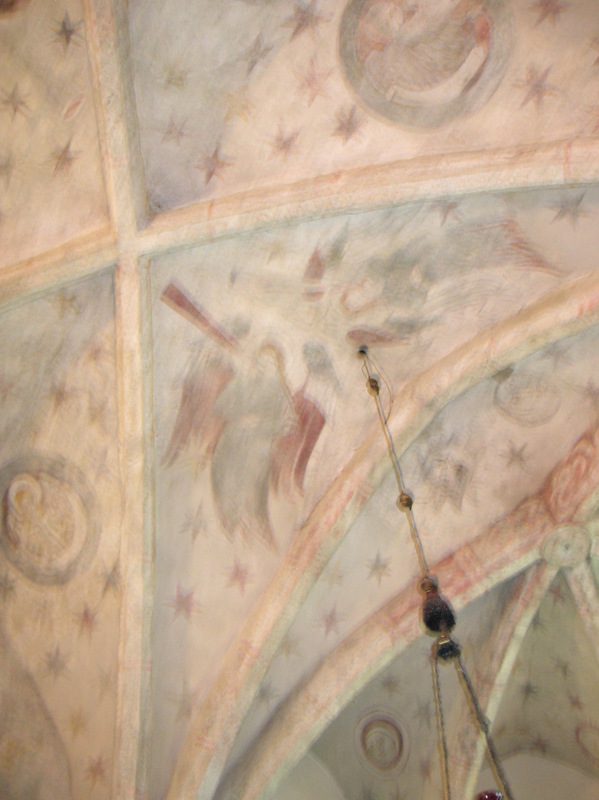 In the small sacristy there were more Gothic wall paintings. The figure of a prophet had been rendered on an arch. 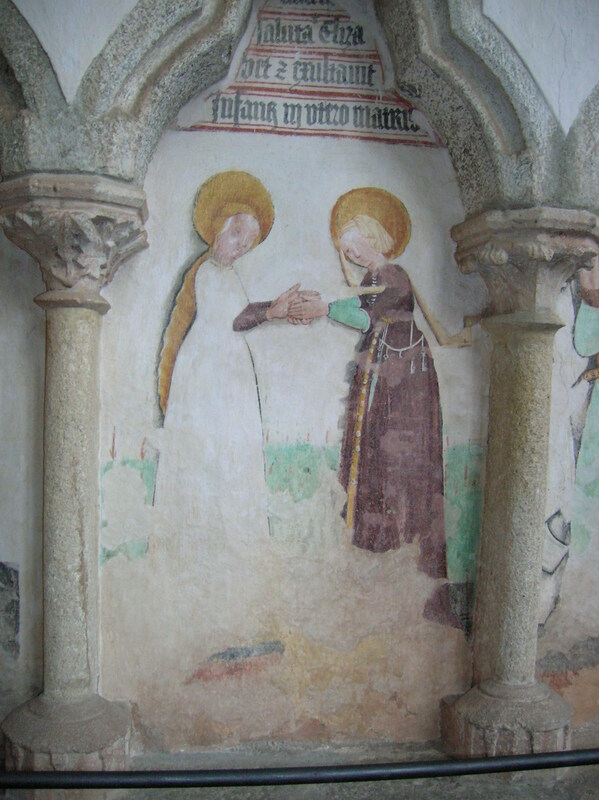 On part of one wall there was a pictorial narrative of the legend of Saint Markéta along with the figure of the devil. Arcades and pillars appeared in the renditions, too. 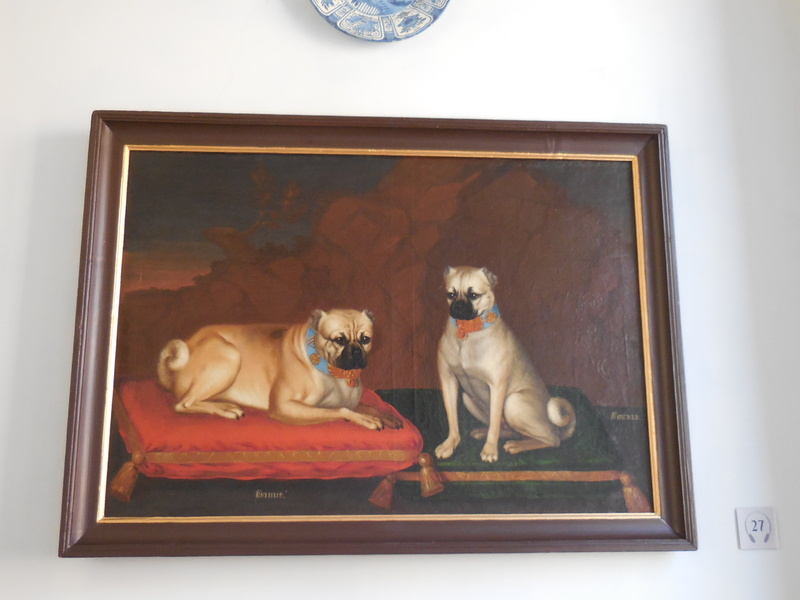 Our guide, who had extensive knowledge of Gothic and Romanesque architecture, explained that the paintings in the sacristy had not been created by the same painter who decorated the presbytery. 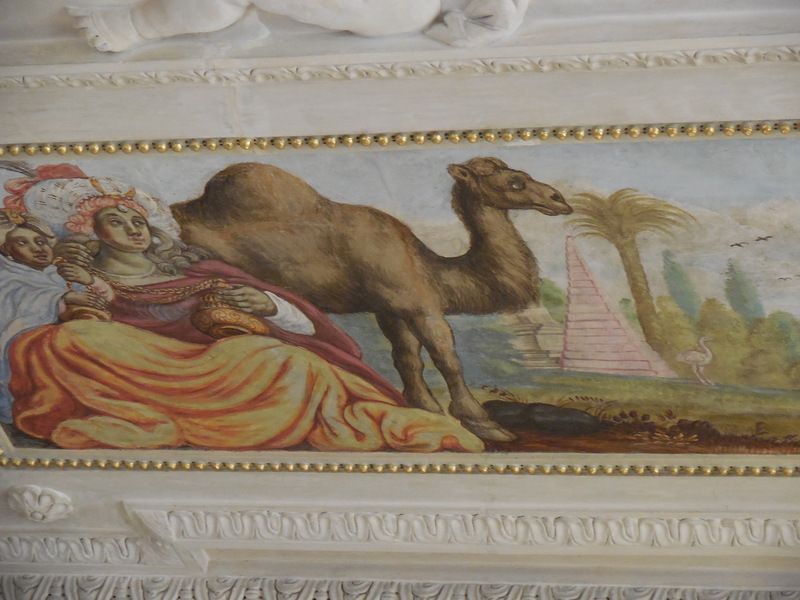 I wondered if there were even more than two contributors to the artwork, who they had been and how they had come about to decorating the church’s interior. That was not all there was to see in Myšenec. Between homes 54 and 8, we gazed at the remnants of a castle and the arch of a gate. The castle had been established by the Přemysl dynasty in the 13th century. I wondered what it would be like to have part of a 13th century castle ruin joined to one’s modern house. It reminded me that history was so connected with the present and how ancient history made up such an important part of each village’s identity. It was fascinating how the two different architectural styles of modern and Gothic played off each other. The Gothic walls and arch looked like an odd extension of the house. They were certainly unique. The Church of Saints Peter and Paul in Albrechtice nad Vltavou was a real gem, perhaps my favorite, if it was possible for me to choose one sight over the others. The church was originally Romanesque from the 12th century and still boasted Romanesque masonry. The tower was Romanesque in style, too. 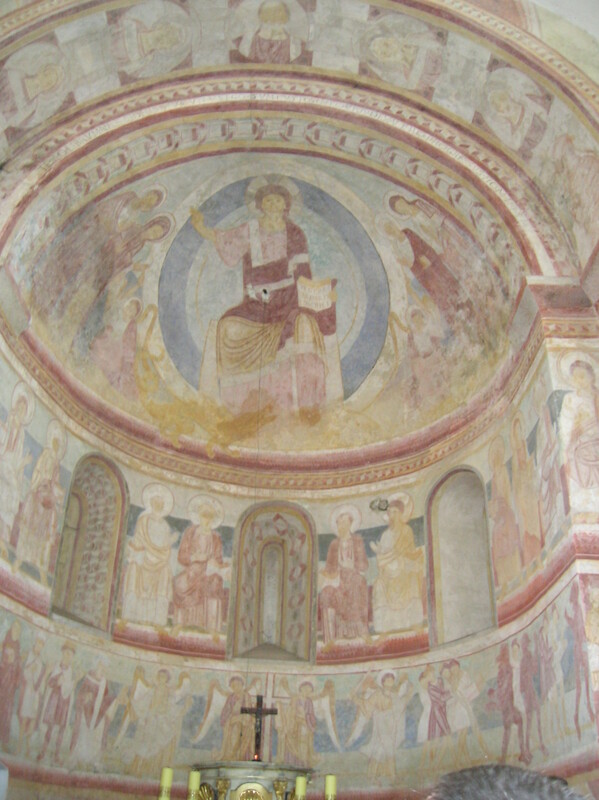 The Romanesque wall painting inside was incredible, dating from 1200 or earlier. On the triumphant arch there were frescoes of The Last Judgment with Hell and Paradise. You could see pictures of Christ rising from the dead. 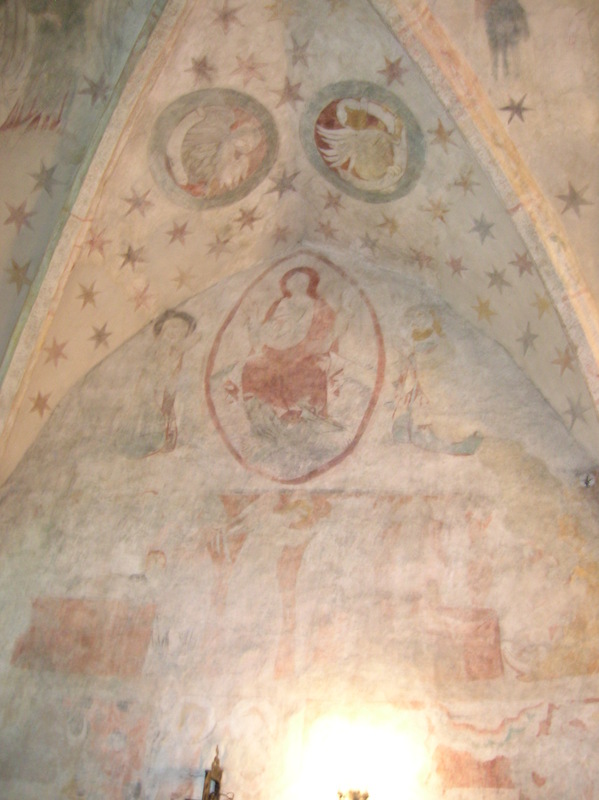 The wall painting was restored during the Nazi Occupation, from 1941 to 1942. I hadn’t been aware that any reconstruction occurred in churches during the Protectorate. There were small, exquisite Gothic paintings in the church, too. But that was not all the church had to offer. 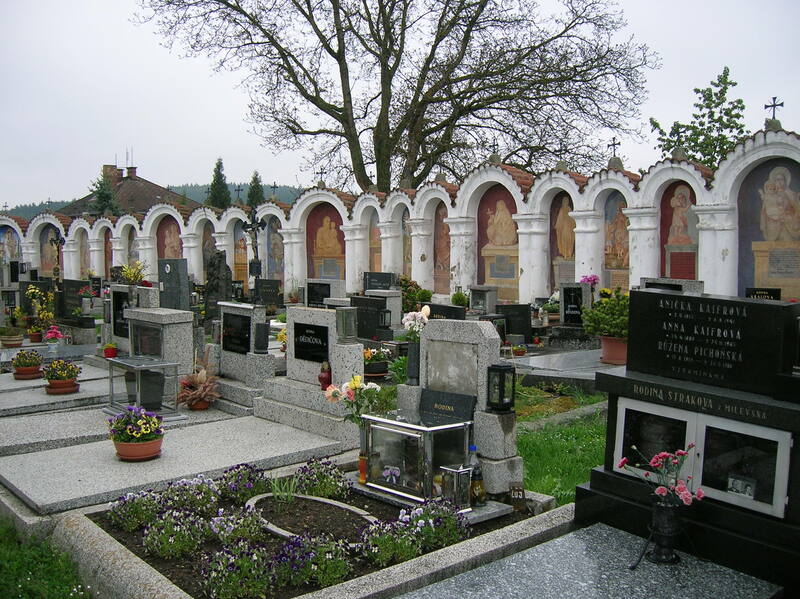 It was surrounded by 85 small chapels behind each gravestone. Each one was unique. They jumped out at the viewer with their bright colors and vitality. 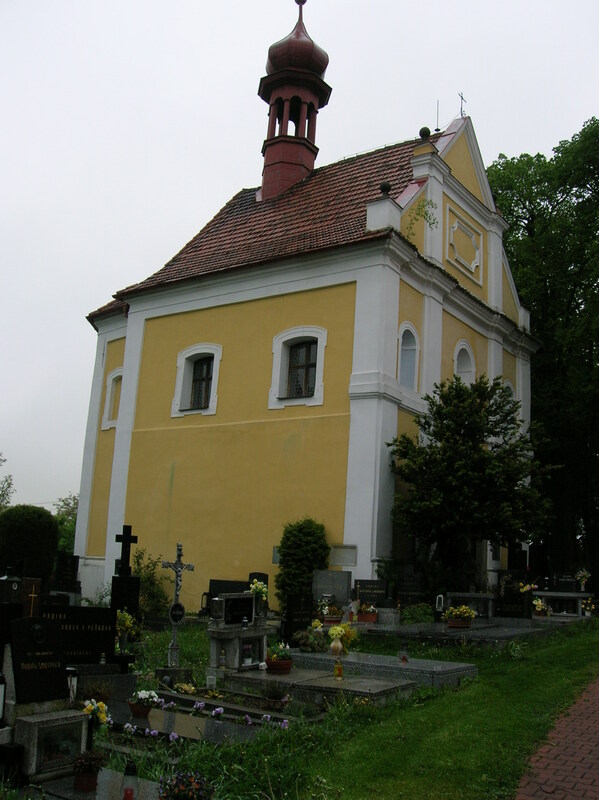 Parish priest Vít Cíza, who served there from 1819 to 1854, had had the innovative chapels built. The first chapels were erected in 1841 and took five years to complete. Renovation took place in the middle of the 19th century. I had never seen a cemetery that actually looked cheerful. 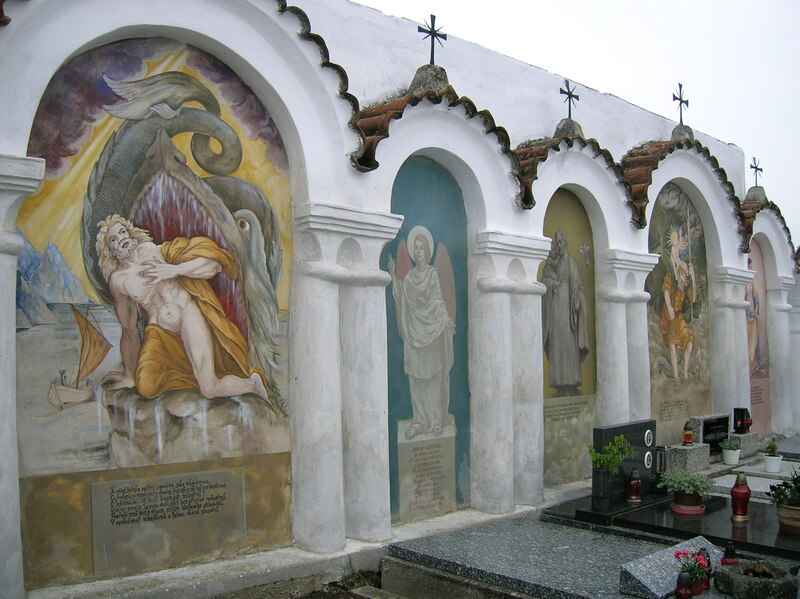 By erecting these chapels, it was as the cemetery was celebrating the lives and the individuality of the people rather than merely mourning their loss. This was the first time I had visited a cemetery and had not been depressed. 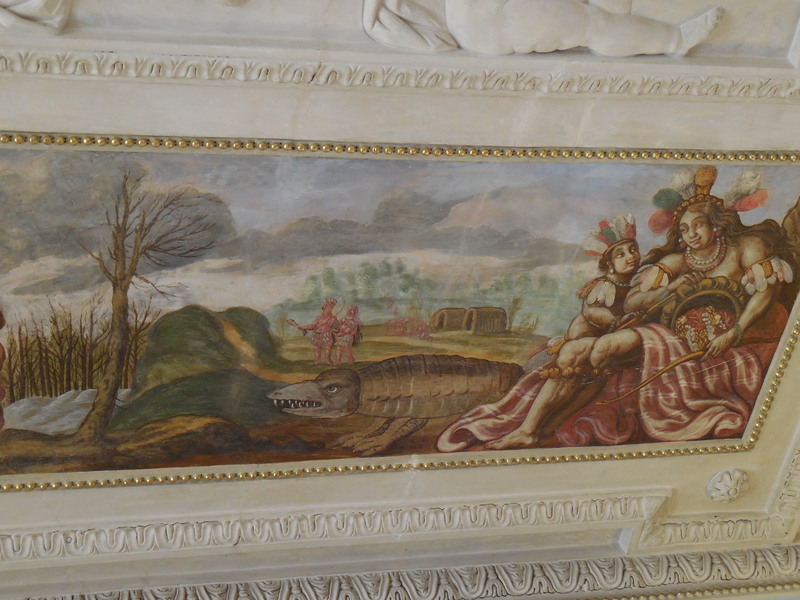 Next we visited Zvíkov Castle, which I had seen several times during my long-time stay in the Czech lands. I was glad to have the opportunity to visit it again as I had not been there for at least 10 years. 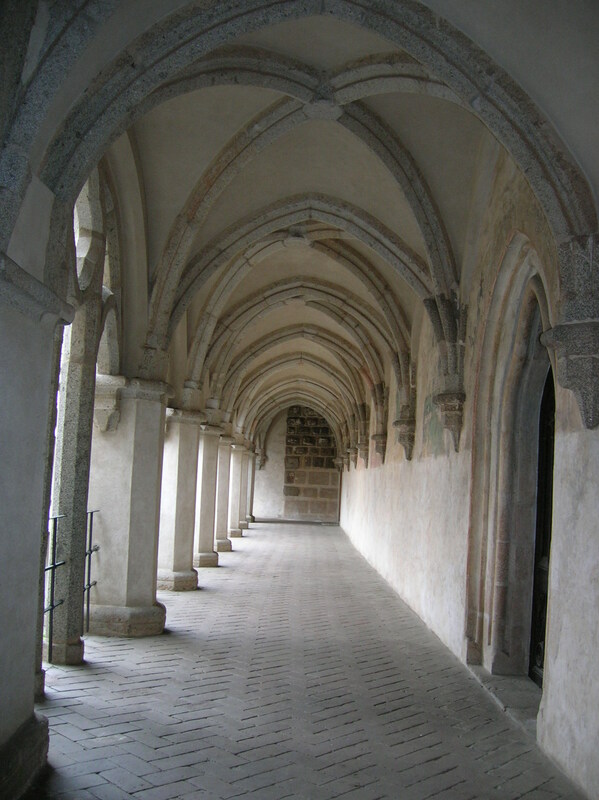 Like the castle in Písek, Zvíkov had a royal palace, four wings and an inner arcade in the courtyard. The crown jewels were even stored there until Karlštejn Castle was finished under Emperor Charles IV’s rule during the middle of the 14th century. Set on an island, Zvíkov was first mentioned in writing during 1234. King Wenceslas (Václav) I started to build it in the first part of the 13th century. Construction on the Royal Palace began around 1250. 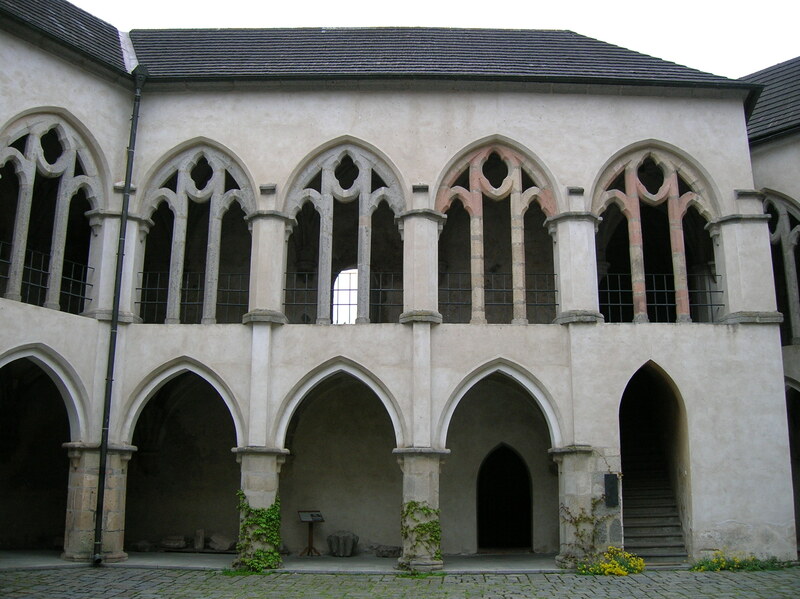 Emperor Charles IV had it renovated during the 14th century. 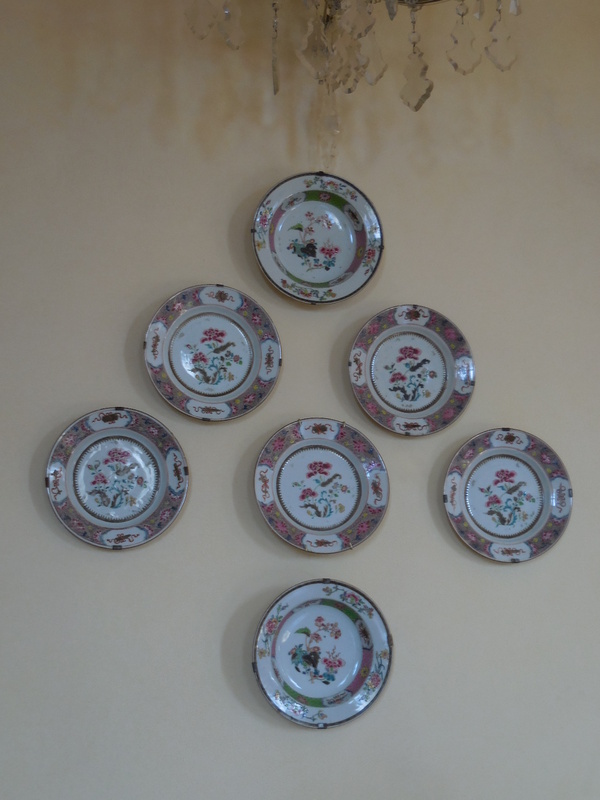 After that there were several owners, including the notable Rožmberk and Švamberk clans. Then came darker days. It was conquered during the Thirty Years’ War, and then Zvíkov was used as a warehouse. 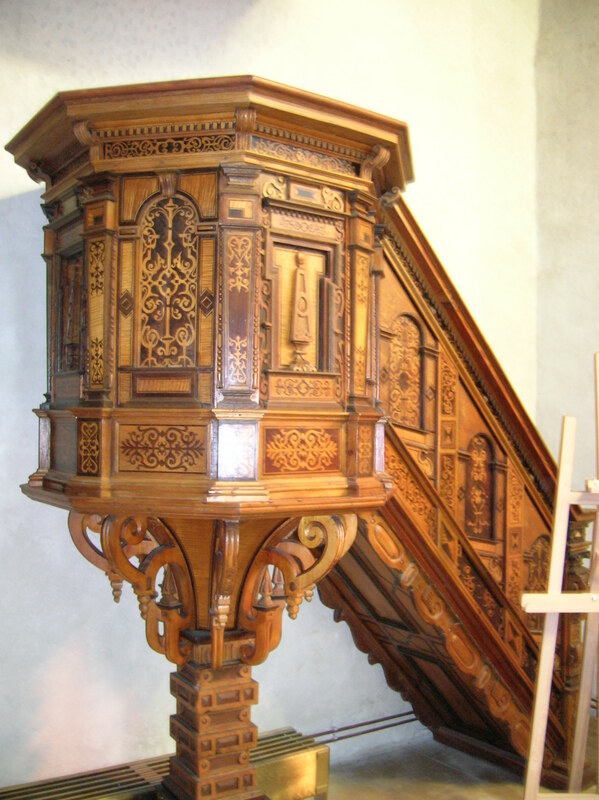 It was not until the Schwarzenbergs took control of it in 1719 that renovations occurred. In the 19th century the castle became dilapidated again, but reconstruction in 1880 put Zvíkov back on the Czech castle map. 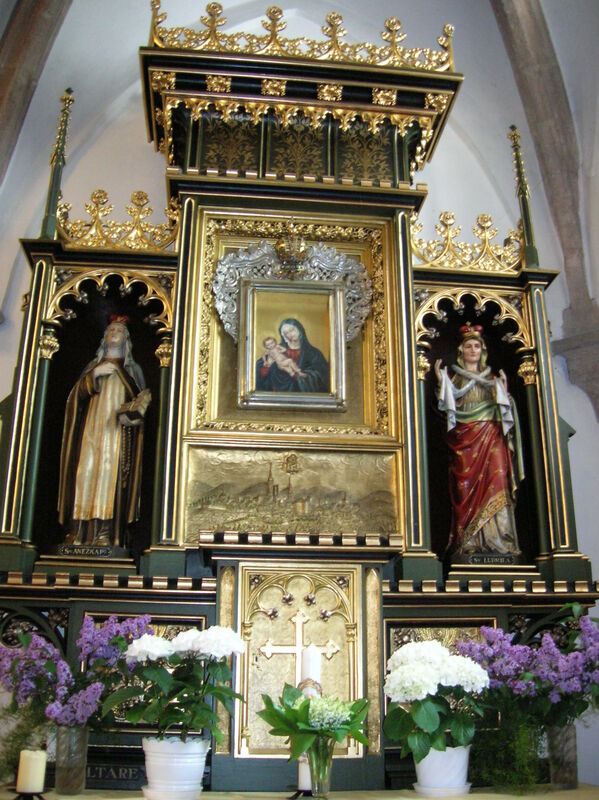 I was most mesmerized by the bright, vibrant Gothic wall paintings in Saint Wenceslas Chapel. They dated from 1480 to 1500. 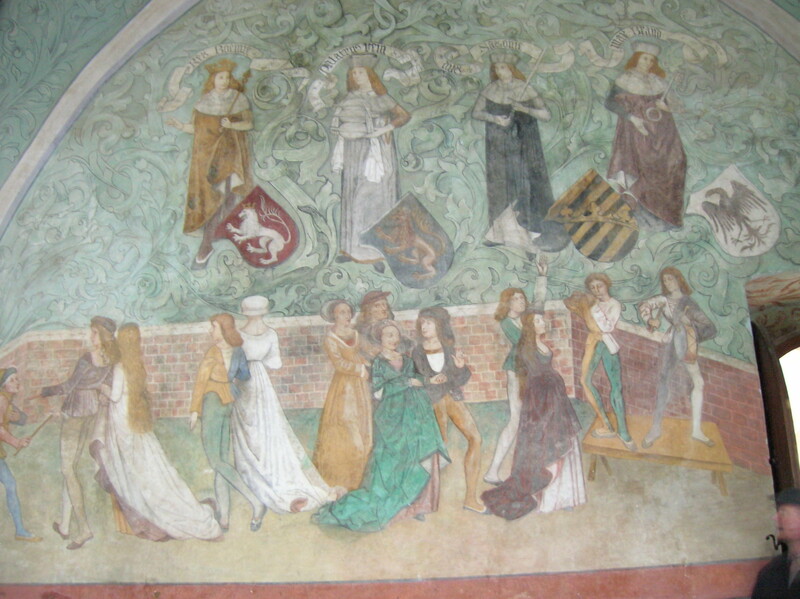 There were also exquisite 15th century frescoes in the Dance Hall. They showed a festive, dancing scene below pictures of the four electors of the emperor, including the Czech king. 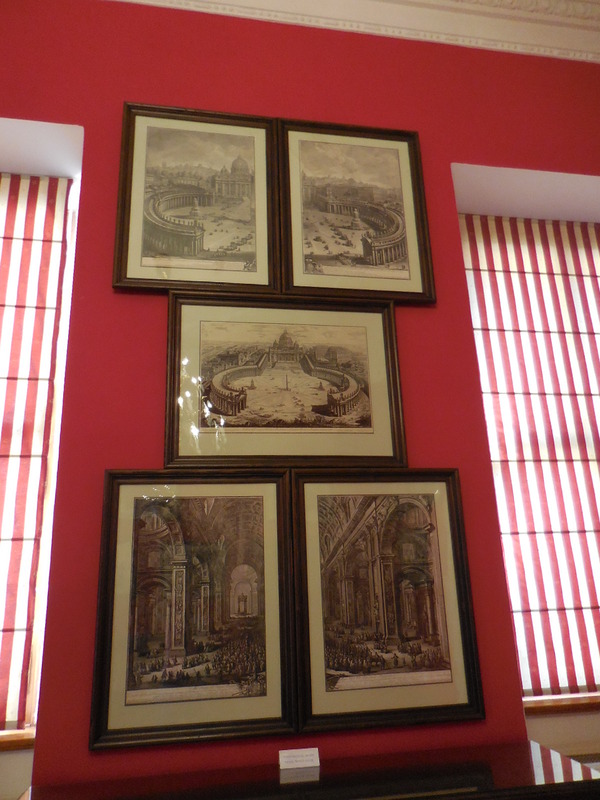 I admired the Lombard chairs, seating with high decorated backs, in the Knights’ Room. 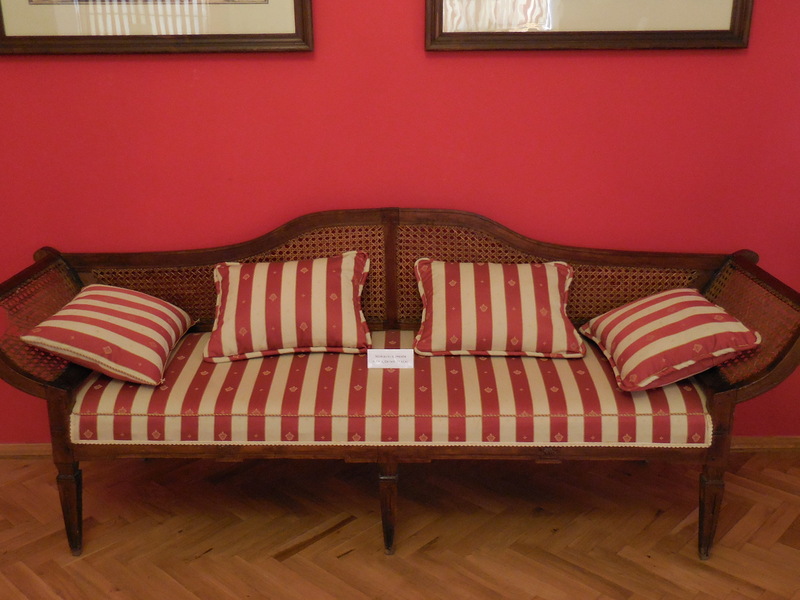 That furniture hailed from Renaissance days, and I thought it looked so distinguished. The Gothic altar was also very impressive. Our last stop was the Holy Trinity Church in Čimelice, which had Gothic masonry but was furnished in the Baroque style of the 18th century. 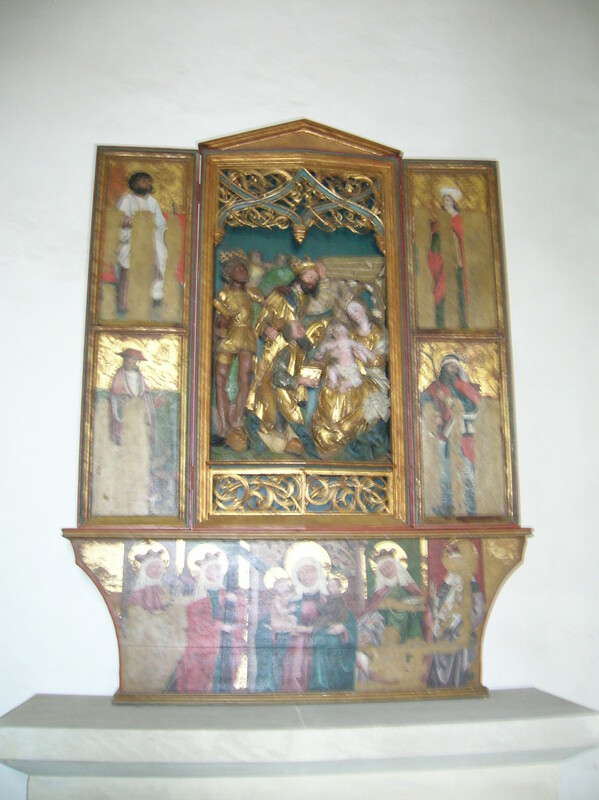 However, the stunning Gothic Madonna on a side altar dated from the second half of the 15th century. 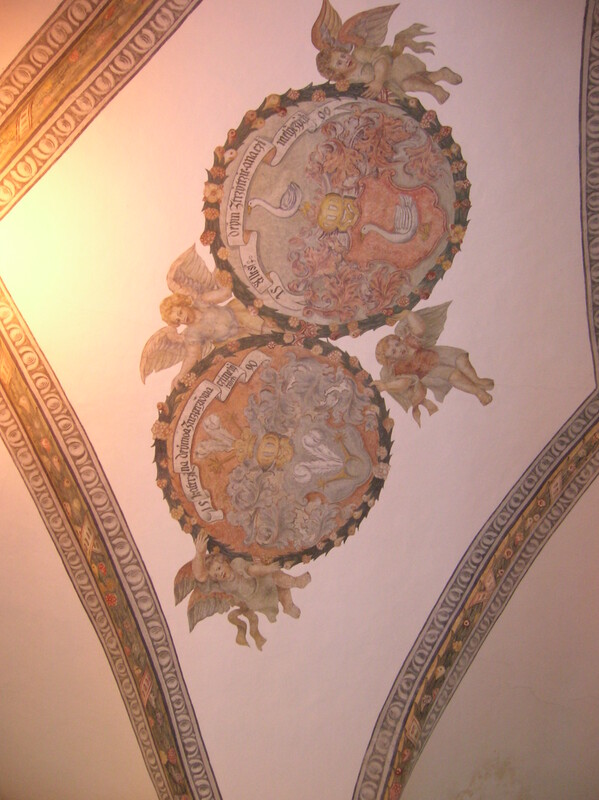 The ceiling was from the Renaissance era, resembling the ceiling of the cemetery church in Písek. The tower had been erected in Empire style during 1821. The altars and sculpture hailed from the second half of the 18th century. 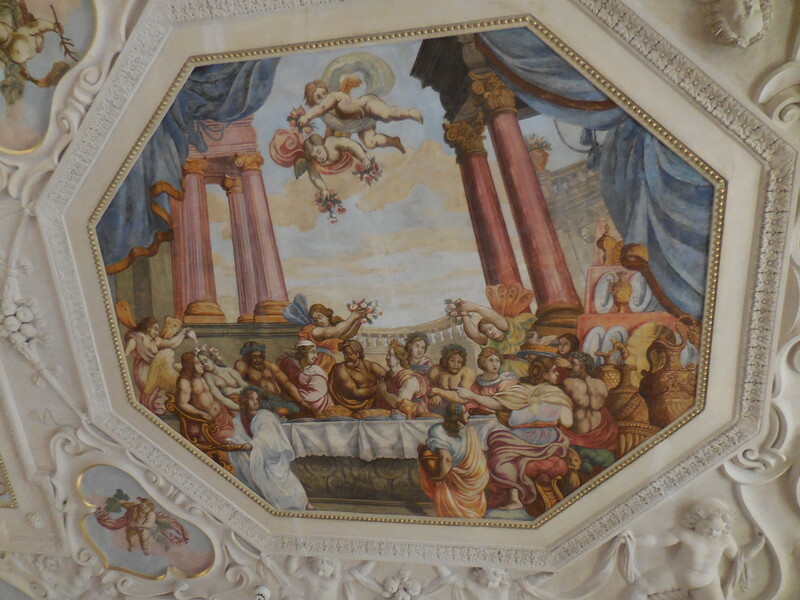 The Baroque Chapel of Saint Barbara was stunning, going all the way back to the first half of the 18th century. Then we were in for a real treat. The man in charge of the church played the 15th century organ for us. Its rich, colorful sound filled the holy space. We also saw a chateau and pond belonging to the Schwarzenbergs, but the chateau had not been restored or was not open the public. The red and yellow colors of the façade reminded me of the magnificent exterior of Dobříš Chateau near Prague. I had found this tour fascinating. I had learned so much about the Czech lands as well as about Romanesque and Gothic architecture and art, thanks to our remarkable guide, who was so knowledgeable and well-organized. I had never realized that villages had so much history. Each village had its own character, its own identity, its own story to tell. It amazed me that the history of these villages was rooted in Romanesque or Gothic eras. I have lived in the Czech lands for more than 20 years, and it still is difficult for me to fathom that Gothic and Romanesque art and architecture could survive so many centuries, so much turbulent history, so many wars. 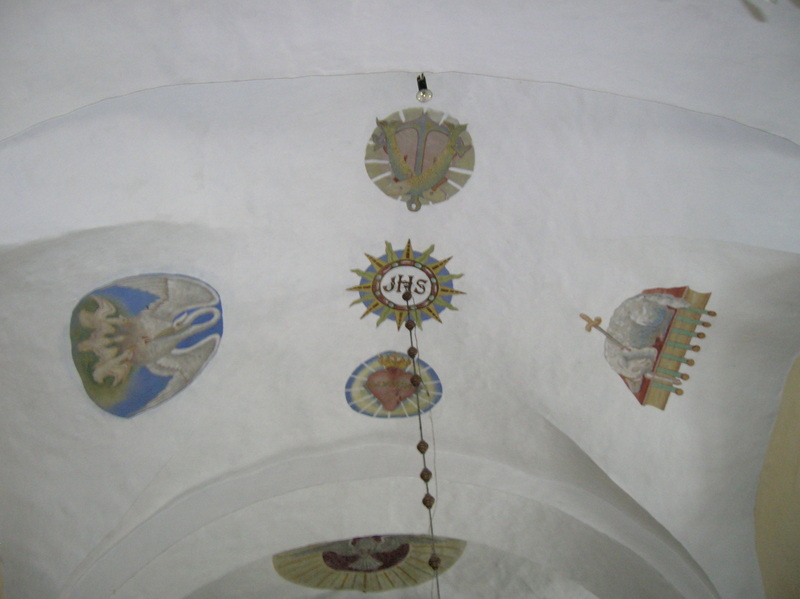 During the tour I was most impressed with the Gothic wall paintings, especially in Zvíkov’s Saint Wenceslas Chapel, in Myšenec and in Albrechtice nad Vltavou. 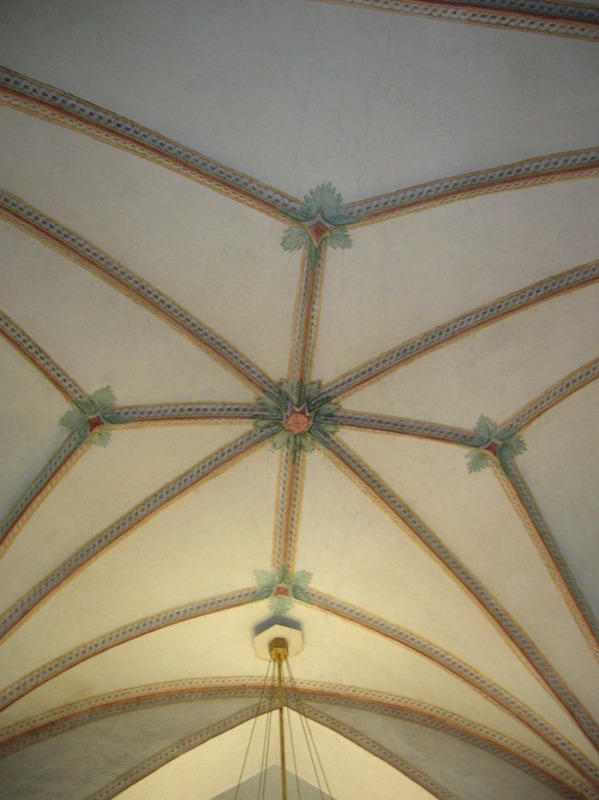 I also was enamored by the stunning arcades and vaulting at Zvíkov Castle. I was enthralled with the stunning arcade chapels on the cemetery walls at Albrechtice. I could not believe that a cemetery could be so full of life. I also was glad that I had seen parts of Písek other than the bus station. Písek really was a charming town. During my many years in the country, I had seen the major castles and sights in south Bohemia – Hluboká nad Vltavou Chateau, Český Krumlov Chateau, Třeboň Chateau, Vyšší Brod and Zlatá koruna monasteries and others. But I had never explored the villages. I had never even thought they were worth exploring, to tell the truth. Now I knew that every nook and cranny of the country had its own rich history, its own secrets to reveal.